Buy and earn 13 points valued at £0.13. C.Gars Ltd is proud to be able to present to our customers the fabulous range of Mr Brog. Since the company’s creation in 1947, Mr Brog have successfully sold over 2 million pipes. Their pipes are the perfect fit for personal use, and they also make the perfect gift. So sit back, browse through the range, inhale, and choose your favourite Mr Brog pipe. - All of Mr Brogs pipes are hand crafted in their factory in Przemsyl Poland. 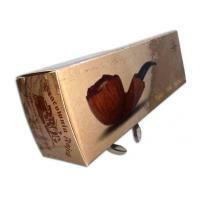 - As pipes are handmade and natural, the colours may vary slightly. A pipe is hand made of briar wood.